Good Monday morning, it's a federal holiday today, but that never stops the news. My latest column explores a wonky fight over something we all depend on — electricity — through the lens of something many of us find interesting: The Hunger Games. Check it out below, and then Ben and I will get you up to speed on all you need to know for what is shaping up to be a busy week. A series of policy actions in Washington and nationwide market trends are scrambling alliances across different energy sources all fighting for a piece of America's stagnant electricity market. Why it matters: The bottom lines of companies across the energy industry depend upon growing their share of the power mix, yet they often also align with each other in different policy and market fights. Your electricity bill and the nation's carbon emissions are also at stake. 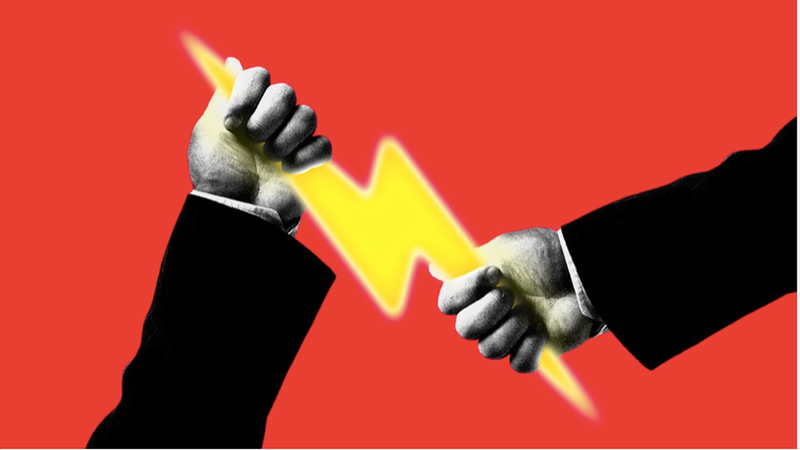 Let's take a look at the forces at play and the unlikely alliances forming in what can best be described as the Hunger Games of America's electricity. Read the rest of my column on the Axios stream here. Rare bipartisan scrutiny for his department's recent request asking the Federal Energy Regulatory Commission to issue a rule favoring coal and nuclear plants. Perry to emphasize that there's no such thing as a free energy market, that President Obama favored renewables, and that coal and nuclear must be part of the future. He made these arguments at an event Friday, according to media reports there. Go deeper: The Hill and Washington Examiner both covered Friday's event, and we previewed the hearing here. Climate change: EPA is set to propose as soon as this week its rule repealing the Clean Power Plan, Obama's signature climate policy. We all know this is coming, but this will serve as the official starting gun for what is bound to be a protracted regulatory, political, and legal fight. EPA will issue a rule repealing the rule outright. Then the agency will take a separate action at another time (specifics to be determined) asking for public comment about what kind of rule to issue cutting carbon emissions. Trade and energy: The United States Trade Representative's office holds a public hearing Tuesday on its investigation into alleged Chinese violations of intellectual property. Why it matters: This case has implications for energy technologies, including solar and nuclear power, both of which were victims of a Chinese hacking of information back in 2014, according to a Justice Department indictment at the time. Juergen Stein, U.S. president of SolarWorld, will testify at the hearing. German-owned SolarWorld is one of two companies seeking tariffs on cheap imported solar equipment in an unrelated U.S. International Trade Commission case. Go deeper: Read the USTR's investigation announcement, an op-ed on the broader investigation, and a NYT piece from the May 2014 Justice Department news. Iran decision looms: One big thing to watch is President Trump's expected announcement by the Oct. 15 deadline that he's decertifying the Iran nuclear deal. Yes, but: That does not mean reimposition of sanctions on its own, but rather sends the question back to Capitol Hill. Congress probably won't move to re-impose U.S. sanctions against Iran, though the White House could act on its own in several months. "European buyers, which account for 25% of Iran's 2.2 [million barrels per day of] crude exports, could potentially stop their purchases to avoid falling foul of US secondary sanctions if those sanctions are unilaterally reimposed. ""We believe the key to the global oil market is whether these flows will be curtailed rather than simply redirected to Asia with the potential impact of eventual US sanctions on international insurance and shipping key to this outcome. "***A few other oil-related items catching our eye...Extraordinary: Via Reuters and elsewhere, OPEC secretary general Mohammed Barkindo told reporters in India Sunday that "some extraordinary measures" may be needed next year to rebalance markets, even though the current output-limiting agreement with OPEC and some non-OPEC producers — notably Russia — is making progress.The comments will reinforce the expectation that the production deal will be extended, perhaps with some changes, beyond the first quarter of 2018.Something to watch this week: The International Energy Agency will release the next edition of its closely watched monthly oil market reports on Thursday, which will take stock of the OPEC efforts.Shelter from the storm: Tropical Storm Nate forced evacuation of many Gulf of Mexico offshore oil-and-gas platforms (check out the Interior Department's Sunday summary here), but look for a quick return. Via Bloomberg's Sunday report:"While an estimated 93 percent of U.S. oil production in the Gulf was still shut, no damage had been reported, suggesting crude and natural gas supplies may quickly rebound this week." Downward trend: New data from two federal agencies provides the latest snapshot of how the shift away from coal in U.S. power generation is pushing down the country's carbon emissions. The latest Energy Information Administration data on energy-related CO2 emissions showed a 1.7% decline in 2016. That brings the energy-related emissions — which is the lion's share of CO2 output — to 14% below 2005 levels. They're just 2.6% above 1990 levels, even though the economy is much larger than it was a quarter century ago. One big question: Whether a suite of Trump administration policies — including the scuttling of Obama-era climate rules and a new proposal to significantly alter wholesale power market pricing — will alter the trend in coming years. Every picture tells a story: Check out the chart above, from my Axios colleague Andrew Witherspoon, that's drawn from EIA data. It helps to explain how the substitution of natural gas and renewables for coal is altering the nation's CO2 footprint. "Natural gas CO2 emissions surpassed those from coal in 2016. However, because natural gas produces more energy for the same amount of emissions as coal, growth in natural gas consumption contributed to the overall 2016 decline in total emissions," EIA said. EIA also notes that while total electricity generation use grew by about 1% from 2005 to 2016, CO2 emissions from electricity fell by 24% over the same stretch, a change attributable to gas and renewables. More data: EPA, meanwhile, released the latest information from a congressionally mandated program under which thousands of facilities from a range of industries must report their greenhouse gas output. It shows a 2% decline, led by reductions in power-sector emissions. Go deeper: Reuters breaks down the EPA data here, and I recommend scrolling to page seven of the EPA report listed above for a good graphic on emissions across various industrial sectors. Cabinet travel controversy: Get up to speed on probes into the use of charter and military planes by top Trump administration officials include the heads of energy and environment agencies. The Energy Innovation Reform Project, which advocates for advanced nuclear reactors and other tech, has brought on BGR Government Affairs, a newly public filing shows. Marathon Oil has retained Ogilvy Government Relations to work on "energy policy and infrastructure." Speaking of Tesla, some news: CEO and founder Elon Musk tweeted on Friday afternoon that he's delaying rollout of the company's highly anticipated semi-truck from this month to November 16. "Diverting resources to fix Model 3 bottlenecks & increase battery production for Puerto Rico & other affected areas," he said. Wider lens: The Detroit Free Press has a useful column that clarifies the sometimes fuzzy distinction between actual electric vehicles (like Tesla's line) and other forms of electrification that still involve fossil fuel-powered engines. "As of 1975, there were three metro areas with at least 10 million people — Tokyo, New York and Mexico City. A list of the 10 largest cities at that time would have included Paris (now 25th), Moscow (22nd) and Los Angeles (21st). Now there are 31 megacities with at least 10 million people, and most of them are in the developing world. The UN projects 10 more will join the list by 2030, and all but one (Bogotá) is in Africa or Asia." "518 million people (7% of the global population) now live in megacities of 10 million or more people. That's a tenfold increase from four decades ago, and it's radically changing the way people live, work and view the world."